Written 10 years after his first book, "Highpower Rifle", "The Rifle Shooter" is a continuation of David's adventures, accomplishments, and insights into the art and technique of precision rifle shooting. This is not just a revision of David's landmark "Highpower Rifle", but an all-new, greatly expanded work that reveals David's thoughts and recommendations on all aspects of precision rifle shooting. Section Four - Technical: rifle design (including the development of the T2K), ammunition (cartridge and bullet selection, reloading techniques, load development and testing), match sights, rifle scopes, barrel selection, cleaning and maintenance, rifle fitting and tuning and stock adjustment. There are special segments on Tactical and Hunting. "The Rifle Shooter" is "...an excellent read for anybody who is interested in precision positional short or long range shooting. Cuts the learning curve off your training by years." 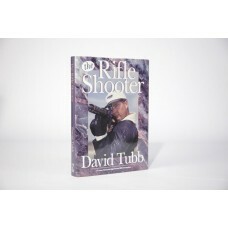 "The Rifle Shooter" will be a prized addition to any serious shooter's bookshelf. 432 pages, 400+ photos, 7x10 size, high-quality printing.